Mommy Aishwarya Rai Bachchan shared an adorable picture of the family having fun at the outing. The photo features the birthday girl surrounded by cakes, her friends, parents Abhishek Bachchan and Aish, grandparents Amitabh Bachchan and Jaya Bachchan and aunty Shweta Bachchan Nanda. 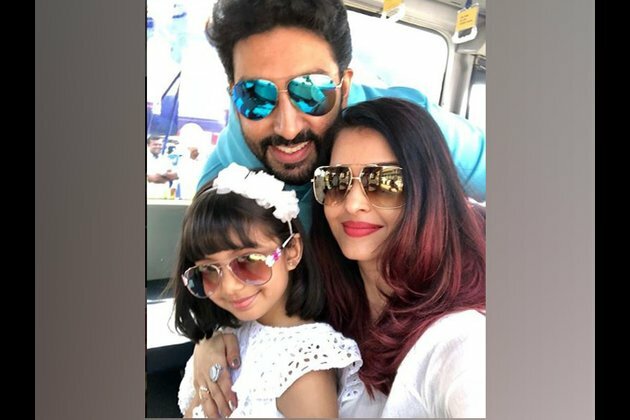 The 'Fanney Khan' star captioned the pic as, "Happy 7th my darling Aaradhya"
Aishwarya also shared another picture of the doting parents posing with their darling daughter. "Love You Angel Aaradhya. Happiest Birthday my darling," she captioned the pic. Earlier in the day, both Abhishek and Amitabh Bachchan took to their respective social media handles to wish Aaradhya on her special day. "Happy birthday little princess! You are the pride and joy of the family. I pray you remain the ever smiling, innocent and loving girl that you are. Love you with all my heart," Abhishek wrote alongside a picture of Aaradhya and wife Aishwarya Rai Bachchan with him. The 'Thugs of Hindostan' actor, on the other hand, wrote, ".. on the eve of the little ones presence in this world .. love and blessings and wishes for all her wishes to come true .. Aaradhya Bachchan .. the blessings of a daughter in the house. . live long .. live happy .. live with pride .."